Finn has been appointed by Fox’s Biscuits, one of the UK’s leading biscuit brands, as its retained PR and social media agency. The Leeds agency was appointed to drive consumer engagement with Fox’s products, which include Crunch Creams, Viennese, Rocky and Chunkie. Finn will implement on and offline PR over the next 12 months to support the brand’s position as "champions of generosity and deliciousness". 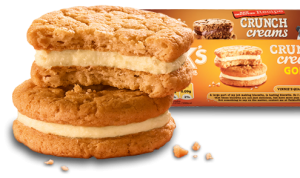 Kate Needham, head of marketing at Fox’s Biscuits, said: “The insight work and creative that Finn developed during the pitch process really made the business stand out from the competition. Fox’s Biscuits has grown from a Victorian bakery in Northern England to become one of the UK’s leading biscuit brands. It currently has three manufacturing sites in Batley, Kirkham and Uttoxeter. Finn's win follows its successful pitch to Finsbury Food Group, a leading speciality bakery manufacturer, to look after its cake business. Its content and creative team will develop a digital programme to drive awareness of the company’s branded and character licensed cakes, in addition to the consumer team leading on traditional media relations.